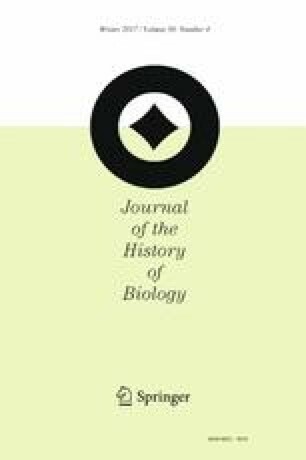 This article revisits the development of the protoplasm concept as it originally arose from critiques of the cell theory, and examines how the term “protoplasm” transformed from a botanical term of art in the 1840s to the so-called “living substance” and “the physical basis of life” two decades later. I show that there were two major shifts in biological materialism that needed to occur before protoplasm theory could be elevated to have equal status with cell theory in the nineteenth century. First, I argue that biologists had to accept that life could inhere in matter alone, regardless of form. Second, I argue that in the 1840s, ideas of what formless, biological matter was capable of dramatically changed: going from a “coagulation paradigm” (Pickstone, 1973) that had existed since Theophrastus, to a more robust conception of matter that was itself capable of movement and self-maintenance. In addition to revisiting Schleiden and Schwann’s original writings on cell theory, this article looks especially closely at Hugo von Mohl’s definition of the protoplasm concept in 1846, how it differed from his primordial utricle theory of cell structure two years earlier. This article draws on Lakoff and Johnson’s theory of “ontological metaphors” to show that the cell, primordial utricle, and protoplasm can be understood as material container, object, and substance, and that these overlapping distinctions help explain the chaotic and confusing early history of cell theory. Lombard, Jonathan. 2014. “Once upon a Time the Cell Membranes: 175 Years of Cell Boundary Research”. Biology Direct 9(32). doi: 10.1186/s13062-014-0032-7.